The conference session reflects the fact the demand for LNG to power small scale clean burn onshore power stations is developing in a number of regions throughout the world. 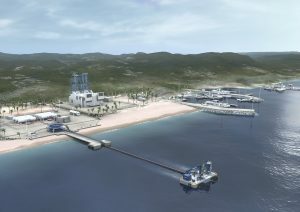 The extensive infrastructure required for a traditional LNG receiving jetty, combined with mooring dolphins is likely to have a significant environmental impact coupled with high capital expenditure. In response to this conflict, Houlder and Wartsila have collaborated with floating hose supplier Trelleborg to support small to mid-scale LNG operations where fixed jetties are impracticable, too costly or environmentally damaging. The Floating Transfer Terminal (below) is based on a compact floating barge that connects to the LNG carrier by means of Houlder & KLAW LNG’s transfer system and to the shore by Trelleborg’s Cryoline cryogenic floating hoses. The LNG Ship / Shore Interface Conference, 16-17 November at London’s ILEC Conference Centre, focuses on the ship/shore interface, where LNG carrier and terminal operations link to load or discharge LNG. Jettyless LNG ship to shore transfer provides a low capital, environmental sound option for members of the LNG supply-chain including, vessel owners and operators, LNG terminal and jetty operators, energy majors, charterers, equipment suppliers, service providers and industry associations. Other speakers at the event include Bureau Veritas, EXMAR Ship Management, Höegh LNG, Royal Haskoning DHV, Trelleborg and the Society of International Gas Tanker and Terminal Operators (SIGTTO). You can read more and book you place here.